(Humor) "Japanese Summer", to Kill "Mosquitoes"
(UPDATE) Funabashi Protest is over now. Organizers say 2,250 people participated. It looks like a great success and fun. Orderly event. Over 9,000 people viewed it on USTREAM. And it looks like some pubs in Funabashi are doing "Demo Discount" for the participants. Excellent business acumen. With music and prompting from an accompanying car (they have DJs in the car), people with something yellow on them are walking the street of Funabashi, Chiba. This is fun. Protesters look just ordinary people. I wonder if they rode the yellow Sobu Line together. For details of this unique protest, see my previous post. By now, it should be obvious that these two statements may be mutually exclusive, because Japan (the government) clearly hasn't learned a lesson, the global economy may be tanking again into another "Great Recession" and global warming (anthropogenic one that the activists have been working on for the past decade or two) may not exist. Nonetheless, the Asia Pacific Economic Cooperation (APEC) made up of 21 Pacific Rim countries is gung-ho on nuclear energy as ever, with lip service to the Fukushima accident and nuclear safety. After all, major nuclear exporters are all members of the APEC: the US, Canada, Japan, China, Russia. And a big uranium exporter (Australia), too. (St. Petersburg, Jiji) The Asia Pacific Economic Cooperation (APEC) Energy Ministers Conference is set to begin here on June 24. On June 23, the draft declaration to be adopted in the Conference was revealed. The declaration would call for Japan to "share the knowledge and experience from the Fukushima I Nuclear Power Plant accident with the international community" and to play a major role in prevention of nuclear accidents and devising safety measures. The draft declaration recognized the importance of nuclear power plant from the standpoint of increasing energy demand in the Asia Pacific region and global warming. In order to deal with these issues, the draft emphasized that "the importance of safety in peaceful use of nuclear energy is to be recognized". Let me see. The APEC members want to continue to build and use (and sell, for some members) nuclear power plants because the region needs more energy and it must fight (man-made) global warming. Therefore, the nuclear power plants must be safe. But the draft says the APEC "will recognize the importance of safety in the peaceful use of nuclear power." So... is all it will do is to "recognize"? The importance of safety? And it is news? Did someone say "Japanese Spring", a la "Arab Spring"? While the "Sring" does not literally mean "spring" as in four seasons, there was a tweet I read yesterday which triggered my uncontrollable laugh. I suppose only Japanese or people who grew up with the particular TV commercial would laugh, but I thought I'd share it here. What's Kincho? 金鳥 characters mean "golden bird" (rooster). It is a trademark of an anti-mosquito incense coil made by a Japanese company (Dainihon Jochugiku Co. Ltd) that's been making the incense coils for 130 years. I think it would be highly appropriate to use that phrase, which conjures up the image of this plant-based mosquito killing incense. There would be many "mosquitoes" in the "Japanese Summer". In the meantime in Egypt, the military looks set to declare the former Mubarak prime minister as the winner of the presidential election over the Muslim Brotherhood candidate. Both sides have claimed victory. For those of you who live in the Tokyo Metropolitan areas, there's an event to go to Nishi-Funabashi in Chiba Prefecture and demonstrate there on Sunday June 24. Why Nishi-Funabashi? Funabashi is Prime Minister Noda's hometown. People planning this has a site "Datsu Genpatsu Suginami (Moving away from Nuke in Suginami)". They are going to Noda's constituency to protest against the restart of Ooi Nuclear Power Plant. The titles of the posts announcing the details of the event are really funny. The message is humorous, too. The route map is on their post. At this point, it seems Japanese people are less afraid of speaking up against the power that be, and of sticking out by doing unusual things like joining a protest. I just saw a bit of live video from Hirosaki City in Aomori Prefecture where a handful of people gathered on the street corner and protested against nuclear power plants and the Rokkasho Reprocessing Plant (located in Aomori Prefecture). 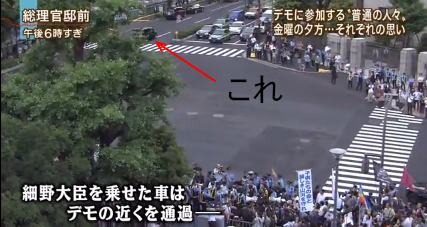 No matter how small, they were there waving signs, and there was someone (Yasumi Iwakami's IWJ volunteer, most likely) who captured it live on USTREAM. Hundreds of people viewed the live stream. Yes, there was such a group. Actually I had read on Twitter earlier Friday warning people that there would be a group planning to "celebrate" the restart of Ooi Nuclear Power Plant right at the Prime Minister's Official Residence in Tokyo just as the protesters would be gathering. The sign says "Nuclear Power, Our Ally. YES! PRO-NUKE", with the picture of "Astro Boy" - Tetsuwan (strong arm) Atomu (Atom). This photo contrasts well the "Astroboy" by the small pro-nuke group and a Paul Klee-ish drawing of a girl holding "No Nukes" sign. It's very interesting that this pro-nuke group put "Astro Boy" on the sign. The author of this extremely popoular manga/TV animation, Osamu Tezuka, didn't like his own creation at all, even though this was what propelled him into the manga stardom in 1952. Astro Boy has a sister named Uran (Uranium), and a brother named Cobalt. It's just my hunch and no proof, but I have always suspected that Mr. Tezuka was compelled to create a character like Astro Boy at that particular time, early 1950s. Atomic power is strong, atomic power is good, atomic power is just. That was the message of the Astro Boy manga and animation. Soon after, an all-out campaign to bring nuclear power to Japan was started by none other than the owner of Yomiuri Shinbun Matsutaro Shoriki, who went on to become the first Secretary General of the Science and Technology Agency (now incorporated into the Ministry of Education and Science). As nuclear fallout from the atmospheric nuclear bomb testing was circling the globe, Tetsuwan Atomu animation was on the Japanese TV, from 1963 to 1966. As I posted earlier, they were inside the Prime Minister's Official Residence as the protest was on-going. Portirland blog, posting the TV Asahi's program video (probably will be taken down shortly by Asahi soon), shows what the response was from each of them. "Minister, there is a huge demonstration right now outside the Official Residence, against the Ooi Nuke Plant restart..." What do you think? 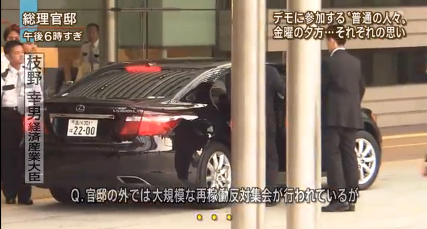 Here's the video of the 11-minute segment in Asahi's report, while it lasts, if you understand Japanese. Ministers' non-comment and comment are about 5:40 into the video. Extremely brief. 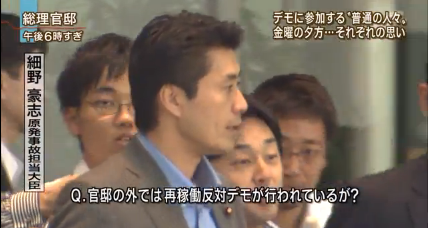 (UPDATE) Video of TV Asahi program reporting the protest in the latest post. Just now, TV Asahi's program "Hodo Station" [news and commentary show] took up the protest in front of the Prime Minister's Official Residence earlier today [June 22]. The program devoted a decent amount of time reporting the protest, it did mention 45,000 protesters - the number as announced by the organizers, it also said the protesters were just totally ordinary people. They even interviewed several organizers. A female newscaster of the program went there as a reporter and interviewed them. The program further mentioned that the protest is carried out every Friday, and that it started out with only a few hundred people but the number has grown rapidly. What was amazing was that the reporter went inside the PM Official Residence during the protest and picked up the sound from the protest. It was deafening. The main newscaster of the program Furutachi was positive on the demonstration, saying that the demonstration was "the voice of ordinary citizens" and that the politics in Japan had become so dissociated with the ordinary citizens. A commentator on the program tried to change the subject and started to say the Japanese citizens should also turn their attention to the contradiction that Japan is showing the sign of moving away from nuclear power generation but at the same time selling nuclear power plants to foreign countries. Mr. Furutachi cut him off, and said "We should first tackle the contradiction of restarting nuclear power plants while the Fukushima I Nuke Plant accident is far from over." Why did they suddenly decide to report the protest? Last week [June 15], I thought it would be them, if anyone should report. But they didn't. It's a mystery. Anyway, it was a very decent report. Tokyo Brown Tabby didn't go this time, but plans to go to the future ones. TBT also says there is a plan to surround the National Diet building on July 29. According to the Japanese mainstream media who suddenly decided to report this 45,000-strong protest in the central Tokyo, the Metropolitan Police put the number at 11,000. Some news outlets (like FNN) only reports this lower number, but Mainichi reported "45,000", so did Tokyo Shinbun. I just noticed the FNN news video starts out by focusing on a very small contingent of ultra-right nationalists (the "black truck" people), as if the protest were being done by extremists. The June 16 protest, which some media did report, was framed as if it were about ultra-left extremists. Asahi Shinbun decided to report only the protest in front of KEPCO in Osaka City, where 1,500 people gathered to protest the restart of Ooi Nuke Plant. Yomiuri Shinbun completely ignored both protests, so did NHK. True to form. IHT: "From Milk to Peas, a Chinese Food-Safety Mess"
No wonder Hong Kong was the largest importer of Japanese agricultural products and food items before the Fukushima I Nuke Plant accident. Meanwhile in TEPCO land in Fukushima, it's a steady stream of slowly degrading systems and equipment that were hastily assembled last year. According to TEPCO's plant status report on June 19, 2012 (Japanese only; there is no English version), a TEPCO worker noticed a hissing sound coming from the flexible duct from the Reactor 3 Containment Vessel Gas Management System on June 19 at about 12:19PM. The Gas Management System is located on the 1st floor of the Reactor 3 turbine building. The duct had been damaged for some unknown reason, and TEPCO says the damage has been temporarily patched up with tape while the cause is being investigated. The company says there has been no effect on the pressure inside the Containment Vessel, the amount of hydrogen gas inside the CV, or the amount of gas flowing through the Gas Management System. MIT Study: "At low dose-rate, radiation poses little risk to DNA"
That is one of the conclusions that the MIT researchers reached after the 5-week study using radioactive iodine on mice. MIT study suggests that at low dose-rate, radiation poses little risk to DNA. “Almost all radiation studies are done with one quick hit of radiation. That would cause a totally different biological outcome compared to long-term conditions,” says Engelward, an associate professor of biological engineering at MIT. “Exposure to low-dose-rate radiation is natural, and some people may even say essential for life. The question is, how high does the rate need to get before we need to worry about ill effects on our health?” Yanch says. Though the study ended after five weeks, Engelward believes the results would be the same for longer exposures. “My take on this is that this amount of radiation is not creating very many lesions to begin with, and you already have good DNA repair systems. My guess is that you could probably leave the mice there indefinitely and the damage wouldn’t be significant,” she says. I have a feeling that the atomic bomb victims have a different take on this. By the way, MIT is one of the 4 US universities that have received special grant for recovery and disaster prevention, from the Japan Foundation, a Japanese government fund to promote international academic and cultural exchange (the same one who are sending the US high school students to Tohoku Region including Fukushima to volunteer in cleanup). MIT got about $70,000, Harvard got $83,000, University of California Berkeley got $62,000, and Randolf-Macon College got $100,000 (one of the graduates from this college died in the March 11, 2011 earthquake/tsunami). MIT's project, utilizing this grant, is "MIT Japan 3/11 Initiative - Disaster-Resilient Planning, Design + Reconstruction". The protest in front of the Prime Minister's Official Residence in Tokyo has been going on since March 29, 2012, according to one of the organizing groups. It's on this Friday, June 22, same place, same time, whether it is being covered by the mass media or not. We have been protesting against the restart of Ooi Nuclear Power Plant in front of the Prime Minister's Official Residence every week since March 29. Initially we had about 300 participants, but the number dramatically increased each week from 1,000 to 2,700, then 4,000, then 12,000. The Fukushima I Nuclear Power Plant accident is far from over, and yet the Noda administration has proceeded as if the restart was a given, without learning any lesson from the accident. The size of this protest continues to expand as anger toward the administration grows bigger. The Noda administration has made the decision [to restart Ooi] ignoring the majority of citizens who are cautious about the restart. Therefore, we don't need to quietly accept their decision. From 6PM ono Friday June 22, we will protest against the restart of the nuclear plant in front of the PM's Official Residence. Also in Osaka, from 6PM to 7:30PM, we will protest in front of the KEPCO Headquarters. Let's show to the Noda administration that we demand the immediate retraction of the decision to restart Ooi Nuclear Power Plant and that we haven't given up at all, this time with the protest from 100,000 people or more, far exceeding 12,000 people last time. Please spread the information and please participate. So it was 12,000, not 11,000 on June 15? Not sure if 100,000 people show up, but looking at the numbers of retweets on the posts announcing the weekly Friday protests, the interest at least to spread the word have increased in recent weeks. But many say it wouldn't matter much anyway (like this CNN article). news that disease has died after a long struggle with Mubarak. Certain things will never change, nuclear accident or not. About the delay in announcing the alarm at the generator cooling system of Reactor 3 at Kepco's Ooi Nuclear Power Plant which is being prepared for the restart, the Nuclear and Industrial Safety Agency under METI decided on a new rule on June 21 that "if an unexpected alarm sounds, it will be promptly announced regardless of the effect on safety". At Ooi Nuclear Power Plant, an alarm sounded at about 9:50PM on June 19 indicating the water level decreased in the tank of the generator cooling system. KEPCO decided that there was no effect on safety, and obtaining the consent from the NISA to do so announced the event in the morning of June 20, more than 10 hours after the event. KEPCO announced on June 20 that there was a slight leak of water from the part of the pump that transfers water from the generator cooling system tank. [According to KEPCO,] the leak had no effect on the water level decrease in the tank on the night of June 19, and there was no effect on the environment. According to KEPCO, a worker was inspecting the area around the generator cooling system tank of Reactor 3 at about 10PM on June 19, when he noticed a minute amount of leak. The water leak was from the tube that removes foreign matters in the water running through the pump. KEPCO has tighten the bolt at the connection of the tube, and is considering replacing it. According to KEPCO's press release, the leak was 0.02cc/second. The press release has a PDF file with a diagram of the system, but it is hard for me to figure out what is what. The location of the leak is not immediately clear, and there is no photograph of the actual leak. It looks KEPCO needs to learn a little bit from TEPCO when it comes to communicating with the outside world. TEPCO's communication skills have improved over the past year under the unfortunate circumstance. LDP "Shadow Foreign Minister: "Prime Minister's Office Refused to Accept Radiation Data from the US"
The Ministry of Foreign Affairs received the fax from the US showing the contamination map created from the actual data collected by Global Hawk drones via the US Embassy in Tokyo on March 18 and 20 last year. The Ministry of Foreign Affairs told Asahi that it immediately forwarded the fax to the Nuclear and Industrial Safety Agency and the Ministry of Education. NISA and the Ministry of Education both sat on the data. A Lower House Representative and "Shadow Minister of Foreign Affairs" of LDP (Liberal Democratic Party) describes the event a bit differently. About the data from the US right after the Fukushima nuclear accident started, the US Embassy asked my office to do something because the Prime Minister's Official Residence wouldn't accept the data from them directly. So I liaised with the PM's Official Residence. However, in the end it was ignored. It is just too irresponsible. Some of the people responding to his tweet are rather critical of him. They say, "So what did you do then? Did you speak out?" Mr. Onodera, as with many people at that time - journalists, experts, politicians, bloggers - may have self-censored so as not to cause panic among the population. Or simply, the earthquake and tsunami damage seemed overwhelmingly bigger than the nuclear accident, even after 3 (visible) explosions. (What happened in Reactor 2 is still not known or disclosed.) It was when some people were saying "Let's go out, have fun and spend money so that the economy doesn't contract and deflation further sets in", as I read at that time on an online message board in Japan. But the government officials at the Prime Minister's Official Residence knew full well what the Fukushima I Nuclear Power Plant accident meant, as Mr. Edano was on record suggesting the evacuation plan for wider areas in Kanto be considered. If what Mr. Onodera says is true, there's some explaining to do for Mr. Edano, Mr. Kaieda, and Mr. Kan. In April this year, a citizen volunteer group in Tsukuba City in Ibaraki Prefecture set up "Ibaraki Citizens Radioactivity Measuring Station" to test food and soil for radioactive materials (iodine, cesium). The group uses AT1320A by ATOMTEX (Belarus) with an NaI scintillation survey meter. So why the huge difference? It turned out that the city's measurement time was too short, and the software for the detector was not updated. When the city lengthened the measurement time and did the software upgrade, the city's detector found 115 Bq/kg of radioactive cesium. At our Citizens Radioactivity Measuring Station, barley harvested in 2011 by one of our staff was found with 110 Bq/kg [of radioactive cesium]. We repeated the measurement a number of times by extending the measurement time, but the result was still about 100 Bq/kg. The same barley had been tested before, using the detector of Tsukuba City. The result then had been 35 Bq/kg. The two numbers diverged so much, so we had it tested again by Tsukuba City's detector. The result was 115 Bq/kg. [Since the previous measurement,] the city lengthened the measuring time from 10 minutes to 30 minutes and did the software version update [for the detector], which allowed their detector to obtain the similar result as ours. Based on this result, we made an oral request to Ibaraki Prefecture and Tsukuba City to re-test the barley grown in the neighborhood areas [of Tsukuba, I assume], but they said they wouldn't, because the barley was for "personal consumption". After we had an opportunity to further discuss with them, we submitted the written request [to the prefecture and the city] today. Mainichi Shinbun (5/30/2012) reported on this written request from this group. In the article, Mainichi says "Tsukuba City stopped publishing the test results for the agricultural products for personal consumption". This news hasn't got much attention in Japan, and the group's site does not have an update. The cloud is called "tsurushi-gumo" (hanging cloud), looking like a UFO, says NHK. It also says that the cloud appears when strong winds blow near Fujisan (Mt. Fuji). And that was what TEPCO's ex-Chairman Tsunehisa Katsumata had insisted in the secret negotiation with the national government (specifically, with DPJ's Yoshito Sengoku, who has no official portfolio), as reported by Nikkei Shinbun on May 14, 2012 (subscriber-only article). In a meeting on June 20 of the "expert committee to review electrical charges" set up by the Ministry of Economy, Trade and Industry to examine the application by TEPCO to raise the household electricity charges, Committee Chairman Junji Annen, professor at Chuo University Law School said, "To be honest, we should have filed for the Corporate Reorganization Act for TEPCO." Annen's remark was in response to Hisashi Anan, Secretary-General of a consumer group called "All Japan Consumer Groups' Liaison Association 全国消費者団体連絡会", who attended the committee meeting and said, "Before raising electricity charges, we should hold accountable the banks that lend to TEPCO and TEPCO's shareholders." Professor Annen further revealed his difficult position by saying, "It would have been better if the Corporate Reorganization Act had been applied to TEPCO to make a fresh start, but the national government decided they would not let TEPCO go bankrupt. We are discussing here on conditions dictated to us [by the national government]." Last fall, Katsumata was selling his idea to the members of the National Diet of separating Fukushima [I] Nuclear Power Plant from TEPCO. The idea was to move the nuclear power plant to a new company funded by TEPCO, reactor manufacturers, and Nuclear Damage Liability Facilitation Fund, and to free up TEPCO to concentrate on the rest of the core business. "We won't allow TEPCO to rid itself of burdens by separating out decommissioning and victim compensations." Edano and Nuclear Damage Liability Facilitation Fund were angry at TEPCO's abrupt announcement to raise electricity charges for businesseson December 22 last year, when the company said it was their "right" to do so. Katsumata's approach makes total business sense. Even the not-very-business-savvy Obama administration had GM and Chrysler go bankrupt and have them reorganized by divesting units, putting the non-performing assets into one company (in case of GM, those assets remained in the old company and a new company was created to carry on the auto business). Bond holders and shareholders were made to eat their losses. Even the 1st-lien bond holders suffered a huge haircut, even though it does seem the labor union got an unfairly large stake in the new company. It has indeed been the "right" (de facto maybe, but nonetheless) for any electric power companies in Japan to raise electricity charges when the "cost" to generate electricity changes. They've been allowed to pass on cost increases to the customers. That "cost" have traditionally included anything from company pension costs to generous interest rates on the savings plan for the employees, and that's what the national government has allowed any electric power company to do. It was in the meeting with Sengoku in mid April, according to Nikkei, that Katsumata told Sengoku that he'd rather see his company go bankrupt than be taken over by the government, whom he clearly considered rank amateurs when it comes to the utility business. Well, for that matter, any business. OT: Ex-President of Egypt Hosni Mubarak "Clinically Dead"
(Reuters) - Hosni Mubarak, who ruled Egypt for 30 years until overthrown by a revolution in the "Arab Spring" last year, was declared clinically dead by his doctors on Tuesday, the state news agency MENA said in a report confirmed by a hospital source. Major Japanese TV Station Reports on the Protest Against Ooi Nuke Plant...in Washington D.C.
Nippon Television, a Yomiuri Shinbun affiliate, reports on the protest against the Japanese government's political decision to restart Ooi Nuclear Power Plant in Fukui Prefecture. It's just that the protest took place in Washington D.C.. I haven't found any coverage of this protest in the major news outlets in the US. There was a protest in Washington D.C. against the decision to restart Reactors 3 and 4 at Ooi Nuclear Power Plant operated by KEPCO (in Ooi-cho, Fukui Prefecture). People from the US environmental groups gathered in front of the Japanese Embassy in Washington D.C., and protested with signs that said "Restart of Ooi Nuke Plant, a new tragedy". The representatives of the groups handed the statement to Prime Minister Noda to the Embassy officials demanding that [the Noda administration] reconsider the restart. The groups will coordinate with the Japanese environmental group and demand the reconsideration of the restart. Not a word from this TV station on the June 15 protest in Tokyo, where 11,000 people gathered. It did report that "400 people gathered in front of the Prime Minister's Official Residence on June 16 to protest against the restart of Ooi Nuke Plant..." (6/16/2012), just like every single news outlet in Japan. The information was disclosed in a public hearing. Mitsubishi Heavy Industry's computer modeling underpredicted the velocity of steam and water by a factor of 3 to 4. According to the NRC who conducted the pressure test, it was "the first time in the history of the nuclear industry that more than one tube at a plant has failed". 8 tubes failed in the Unit 3's steam generators. The unusual equipment issues that have shut down the San Onofre nuclear power plant appear to be the result of faulty computer modeling by manufacturer Mitsubishi Heavy Industries, officials from the U.S. Nuclear Regulatory said Monday. The agency used a public hearing in San Clemente to present the preliminary results of its inspection of the plant, which has been out of commission for more than four months after a steam generator tube sprang a leak, releasing a small amount of radioactivity. That led to the discovery that tubes were vibrating excessively and rubbing against each other, leading them to wear out more quickly than normal for equipment that had been operating for less than two years. The NRC ordered plant operator Southern California Edison to keep the plant shut down until operators fully understand the wear and how to fix it. Eight tubes in the plant's Unit 3 failed pressure testing, which NRC officials said Monday was the first time in the history of the nuclear industry that more than one tube at a plant has failed. "This is a significant, serious safety issue," said NRC Regional Administrator Elmo Collins. "This is a very difficult technical issue, and to be honest, it's not one we've seen before." NRC officials said it appears that simulations by Mitsubishi underpredicted the velocity of steam and water flowing among the tubes by a factor of three to four. The rate of flow caused the tubes to vibrate and knock against each other. There were also issues with support structures intended to prevent vibration in Unit 3, but apparently not in Unit 2, officials said. Mitsubishi did not have any representatives at the meeting and couldn't immediately be reached for comment. Collins said, however, that even though Mitsubishi did the computer modeling, the ultimate responsibility lies with Edison. NRC and Edison officials did not give a timeline for restarting the plant, saying there are still unanswered questions and more inspections that need to be done. #Radioactive Japan: Iwaki City's Water Department Campaign "Let's Drink City's Tap Water!" I'm pretty sure the city's water department does this every year. Iwaki City in Fukushima Prefecture says it has selected a drawing by a 4th grader for its "Tap Water Week" campaign. It has been made into postcards to be distributed at the city's public facilities (municipal government branches, public libraries, community halls) and tourist and cultural facilities. They will be given to all elementary school children in Iwaki City. From Water Department of Iwaki City: "Let's Drink Tap Water!" In recent years, mineral water in PET bottles have been popular. But tap water is gentle on the environment, safe and secure, and delicious water. Water in Iwaki, blessed with nature. Water that you can enjoy right from the tap. Let's drink in big gulps! All the kanji (Chinese characters) on the postcard have "furigana" (kana, or phonetic Japanese characters over kanji to indicate pronunciation) so that even the 1st graders can read. Iwaki City still does the testing of drinking water for radioactive cesium, and it has been ND (not detected). The detection limit is 1 bq/kg. Goshi Hosono, Minister of the Environment and Minister in charge of nuclear accident, and former personal assistant to former PM Naoto Kan when the Fukushima nuclear accident started, appeared on NHK's program "Close-Up Gendai" on June 18, 2012. Here's the segment where he blurts out a story he must have carefully memorized (in an occasionally mangled speech) to impress the NHK viewers on the sincerity of the government when it says Ooi Nuclear Power Plant is safe. In it, Hosono speaks of radiation exposure "kindly experienced by the residents" of Namie-machi, Fukushima Prefecture. I transcribed what Hosono said in the video and translated below. I am not saying we've done everything. It is true that there are problems. However, all that can be done at this stage is being done by the national government, and the local prefecture, Fukui Prefecture, is also kindly doing it, I believe. The first two sentences seem true enough. But the third? From the governor of Fukui Prefecture, we know that all Fukui Prefecture did was to rubber stamp what the "experts" said, and to rely on the word of the KEPCO president that he would try his best. Hosono says everything that can be done is being done, and that is what he believes. What if he's wrong? "Out of expectation" - 想定外 (soh-tei-gai) of course. Uh, about people in Namie-machi, I cannot help thinking about them. Back then [first few days of the nuclear crisis], first 10-kilometer, then 20-kilometer evacuation areas were determined and set, by the national government. At that time, uh, the direction [in which Namie-residents should evacuate] should have been given but it wasn't. Uh, it's not that much radiation exposure was kindly experienced by the residents, that we were able to confirm later. But the thoughts and feelings of people who experienced it, I think we should never forget. Again, the first two sentences seem true enough. It was the government under PM Kan whom he served as a personal advisor who confidently (at that time, I remember) declared 10 kilometer-radius evacuation zone was more than sufficient, and the further away people went from the crippled plant the far less risk they would have from radiation exposure. 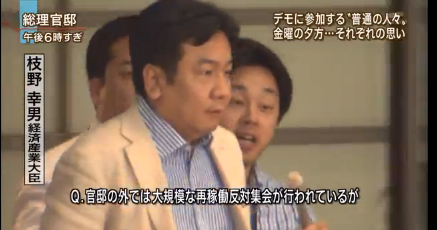 Hosono now says the government should have told the residents which direction to go. Well it did. It told the residents to move as far away from the plant as they reasonably could, i.e. all directions. As to whether Namie-machi residents were exposed to much radiation, I don't believe it has been "confirmed". There is no meaningful data on early radiation exposure suffered by the residents in Fukushima Prefecture, because government officials, from the national government on down, didn't allow researchers to conduct a meaningful survey of enough people in the early days and weeks of the accident. Namie-machi is where the radiation level of 330 microsieverts/hour were measured on March 15, 2011 by an official from the Ministry of the Education and Science. Not only many Namie residents remained for weeks after the start of the accident, but they were eating the food and drinking water that were contaminated, without knowing. For that very reason, the national government is implementing the special surveillance system [for Ooi Nuke Plant], uh, to closely monitor the situation at the nuclear plant. And, uh, we have to create a situation of no accident, but if by any remote chance there is a trouble, we are building a system so that the accurate information will reach the affected municipalities. 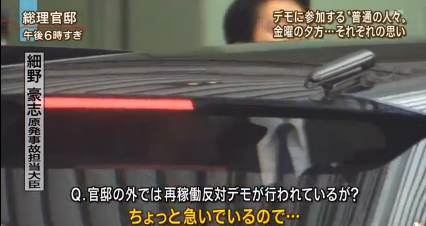 We also know what this "special surveillance system" that Hosono is talking about. It is the Ooi Nuke Plant Off-Site Center, 7 kilometers away from the plant, at the foot of the peninsula where the nuclear power plant is located, manned by the senior vice minister from the Ministry of Economy, Trade and Industry assisted by a KEPCO vice president and NISA bureaucrats, all of whom will be babysat by managers from the plant manufacturers. Just like the Off-Site Center for Fukushima I Nuke Plant, everything relies on the electricity not cut off even in the case of a severe accident. Hosono looks as if he doesn't understand anything he is saying. The female interviewer, a veteran announcer at NHK I think, is not there to ask questions but to help Hosono along so that he can regurgitate what he's been fed as quickly as possible. 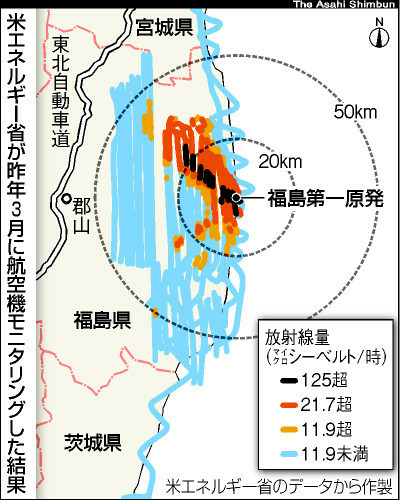 The article that appeared in Asahi Shinbun on February 24 this year says the Self Defense Force made one of their helicopter available for the government to conduct an aerial survey of radiation in the early afternoon of March 12, 2011, before the Reactor 1 building blew out at Fukushima I Nuclear Power Plant. Sometime in the morning on March 12, 2011, Ministry of Education and Science asked for a SDF helicopter to be used for radiation monitoring. Ministry of Defense agreed, and sent one medium-size helicopter at 11:10AM from its base in Sendai, Miyagi that had been used for disaster relief to Rokkasho-mura, where the Nuclear Safety Technology Center staff were supposed to be waiting. The helicopter landed in the meeting place (a park in Rokkasho-mura) at 1PM, but there was no one waiting for the helicopter. So it took off at 1:10PM. The Nuclear Safety Technology Center in Rokkasho-mura received the instruction from the Ministry of Education at 1:30PM. Two people went to the meeting place, and waited for the SDF helicopter to show up for one hour from 2:40PM. The center assumed the SDF heli was busy doing the disaster relief, and decided to drive to Fukushima the next day (March 13) at 9AM. The aerial radiation survey was then scheduled on March 15, but that was canceled because of the information that "Reactor 4 blew up". The aerial survey wasn't carried out until March 25. The Nuclear Safety Technology Center's Rokkasho-mura branch had the staff and the equipment to conduct aerial radiation surveys. First, it confirms that the Ministry of Education and Science knew the radiation from Fukushima I Nuclear Power Plant was leaking in the morning of March 12, 2011. Second, neither the SDF nor the Nuclear Safety Technology Center bothered to try to contact each other when there was no one at the meeting place (Rokkasho-mura park), or when there was no helicopter. I doubt that they had a direct means of communication, but the SDF helicopter pilot could have contacted the base who could have contacted the SDF headquarters/Ministry of Defense who could have contacted the Ministry of Education. The Asahi article specifically says that the head of the Radiation group at the Emergency Response Center (ERC) under the Ministry of Economy, Trade and Industry was a bureaucrat on assignment from the Ministry of Education. The Ministry of Education blames the ERC of course, saying "It was the ERC under the Ministry of Economy, Trade and Industry who proposed an aerial [radiation] monitoring. It was the ERC who coordinated with the Ministry of Defense. We immediately conveyed the ERC messages to the Nuclear Safety Technology Center." Third, Asahi didn't report it until February this year. Fourth, I managed to miss the news when it appeared in February this year. The US Department of Energy and the US military were conducting the aerial survey using Global Hawk drones from March 17 to 19 last year, and they SHARED the results with the Japanese government. The Japanese government sat on it. Asahi Shinbun first reported it in March 24 last year, and it just reported the news again on June 18 this year. According to the June 18 article, the Ministry of Foreign Affairs received the fax from the US showing the contamination map created from the actual data collected by Global Hawk drones via the US Embassy in Tokyo on March 18 and 20 last year. The Ministry of Foreign Affairs told Asahi that it immediately forwarded the fax to the Nuclear and Industrial Safety Agency and the Ministry of Education. NISA and the Ministry of Education both sat on it. Probably because it came from the Ministry of Foreign Affairs. What does the Ministry of Foreign Affairs know anything about radiation? Right? Moreover, Mainichi Daily (English paper) reported on March 19 last year that the Japanese government was in possession of near-real time video footage of Fukushima I Nuclear Power Plant taken from Global Hawk, with the permission from the US to release to the general public. The Japanese government sat on it. I think it is still sitting on it. Japan was the worst possible place for a major nuclear accident to occur - bureaucracy that plays bureaucracy in an extreme emergency, politicians who cannot lead in an extreme emergency, and the populace who cannot even properly "panic" in an extreme emergency. (Now They Tell Us) Minister of Reconstruction Tells #Fukushima Town Mayor, "Decontamination Has Its Limits"
Minister of Reconstruction Tatsuo Hirano met with Mayor of Namie-machi Tamotsu Baba on June 17 in Nihonmatsu City in Fukushima Prefecture and discussed the decontamination effort. Minister Hirano reported to Mayor Baba the result of the model decontamination that showed what decontamination could do and could not do. According to the result, by decontaminating a road [surface] for 2 and a half minutes the air radiation level would go down by one-third, but beyond that there was hardly any effect of decontamination. The reduction of radiation by wiping off the roofs and walls of a residence varied significantly, between 19 and 66 percent, and the conclusion was that "not much effect in reducing the radiation can be expected by repeating the same decontamination". After meeting with the Namie-machi Mayor, Mr. Hirano spoke with the press. He said, "Maybe the national government has given a wrong understanding [impression] that decontamination will instantly reduce (the annual cumulative radiation exposure) to less than 1 millisievert", admitting to the limit to what decontamination could do. On the other hand, the long-term goal of decontamination policy of the national government "to aim for 1 millisievert [per year] and below" [of radiation exposure of the general public] would be maintained, Hirano said. As to how to achieve the goal, however, he didn't specify other than to say "We will develop new technologies." What decontamination by the national government has achieved, other than giving a lot of contracts and money to the large national general construction companies? Not much, a government minister has finally admitted. New decon technologies? I think the most effective of all is "time". It is a huge number for a place like Fukui, where Ooi Nuclear Power Plant is located. The organizers say there are about 4,000 people gathered.